Definitive diagnosis must be based upon the clinical, radiographic, and histological evaluation. When clinical and radiographic characteristics are suggestive of a periapical inflammatory lesion, extraction or endodontic treatment of the affected tooth is advised and the management of radicular cysts include total enucleation in the case of small lesions, marsupialization for decompression of larger cysts, or a combination of the two techniques. Marsupialization is usually preferred in case of radicular cyst of primary teeth to preserve the vitality of unerupted successors, where a surgical window is created by removing a part of cystic lining to enable drainage of cystic content and loss of cystic pressure followed by which a pack is given to promote reepithelization and to provide antimicrobial property. Radicular cyst associated with primary molar following incomplete pulp therapy and its management is presented. An 8-year-old boy reported to Department of Pedodontics and Preventive Dentistry, Rajarajeswari Dental College and Hospital, Bangalore with the chief complaint of pain in lower left back tooth region since 1 month. The pain was insidious in onset, intermittent, dull aching type, and aggravates during the night and relieves on taking medication. Pulp therapy on mandibular left primary second molar was initiated before 1 year previously and was incomplete due to poor compliance of the child and parent towards the treatment. The child was alert, conscious, moderately built, and nourished. On extraoral examination, a diffuse swelling was present on the lower left back tooth region, extending from corner of the mouth to angle of mandible anteroposteriorly, and from ala of nose to base of the mandible superioinferiorly with local rise in temperature. Submandibular lymph nodes showed tenderness and were palpable on the involved side. Intraoral examination revealed grossly destructed mandibular left primary second molar with open wide cavity containing cotton pellet with pulpal medicaments and mobility of mandibular left primary first molar presented with vestibular tenderness and obliteration [Figure 1]a. Mandibular left second molar was tender on percussion. The intraoral lesion was rubbery and fluctuant on palpation. The panoramic radiograph [Figure 2] revealed a well-defined unilocular radiolucency in left mandibular posterior region with continuous hyperostotic border extending from the mesial surface of mandibular left primary first molar to the distal surface of mandibular left permanent first molar suggestive of a cyst. The radiolucency also involved the unerupted mandibular left premolars. Extraction of the mandibular left primary first and second molars under local anesthesia followed by marsupialization of the cyst was carried out. Cystic content was drained out and the bony tissue obtained was sent for histopathological evaluation, which confirmed the diagnosis of radicular cyst. Surgical pack with half width ribbon gauze dipped in bismuth iodoform paraffin paste (BIPP) was placed and stabilized with suture. A part of the pack was left out of the cystic space for easy retrieval. The child was prescribed with antibiotics and analgesics and also guided to maintain good oral hygiene measures. The suture and the pack were removed after 1 week. During the follow-up period, the child responded well for the treatment with good soft tissue and hard tissue healing [Figure 1]b and [Figure 3]. Figure 3: Intraoral periapical radiographs (IOPA): Pre-operative, after one month and after 6 months. In most of the cases, periapical radiolucency relating to primary teeth tends to be misdiagnosed as a periapical granuloma of the primary teeth, or a dentigerous cyst from the permanent successors. Evidence of a nonvital tooth. Painless lesion associated with a primary tooth. Well-defined unilocular radiolucency associated with a primary tooth. No involvement with a successive permanent tooth. No association with the successive permanent tooth. Confirmation of a cystic epithelial lining. However, the success of the treatment depends on the patient and parent compliance and the practice of good oral hygiene measures. The children undergoing similar treatment for radicular cyst should be followed-up postoperatively at regular intervals until the eruption of the permanent teeth to assess the success of the treatment. 1. Shear M. Cysts of the Oral Regions. 2 nd ed. Bristol: John Wright and Sons; 1983. 2. Mass E, Kaplan I, Hirshberg A. 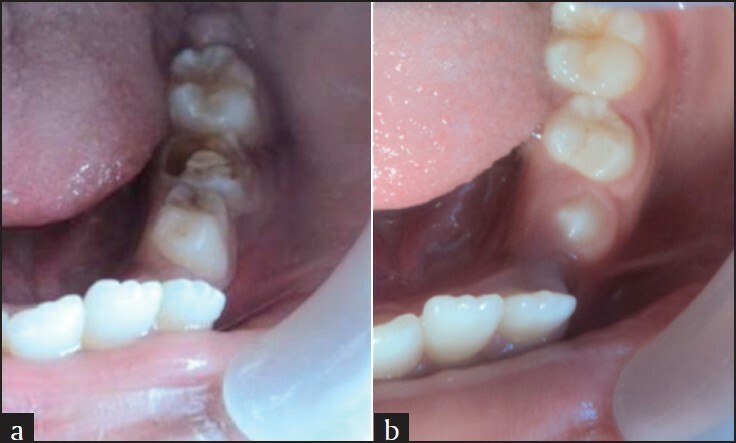 A clinical and histopathological study of radicular cysts associated with primary molars. J Oral Pathol Med 1995;24:458-61. 3. Shear M. Cysts of the oral regions. 3 rd ed. Boston: Wright; 1992. p. 136-70. 4. Wood RE, Nortjé CJ, Padayachee A, Grotepass F. Radicular cysts of primary teeth mimicking premolar dentigerous cysts: Report of three cases. ASDC J Dent Child 1988;55:288-90. 5. Kramer IR, Pindborg JJ, Shear M. Histological typing of odontogenic tumours. 2 nd ed. Berlin: Springer Verlag; 1992. 6. Sprawson E. Further investigation of the pathology of dentigerous cysts with a new treatment based thereon. Proc R Soc Med 1927;20:1781-92. 7. Grundy GE, Adkins KF, Savage NW. Cysts associated with deciduous molars following pulp therapy. Aust Dent J 1984;29:249-56. 8. Hill FJ. Cystic lesions associated with deciduous teeth. Proc Br Paedod Soc 1978;8:9-12. 9. Goaz PW, White SC. Infection and inflammation of the jaws and facial bones, cysts of the jaws, benign tumors of the jaws. In: Oral Radiology Principles and Interpretation. 3 rd ed. St. Louis: Wright; 1994. p. 381-473. 10. Takiguchi M, Fujiwara T, Sobue S, Ooshima T. Radicular cyst associated with a primary molar following pulp therapy: A case report. Int J Paediatr Dent 2001;11:452-5. 11. 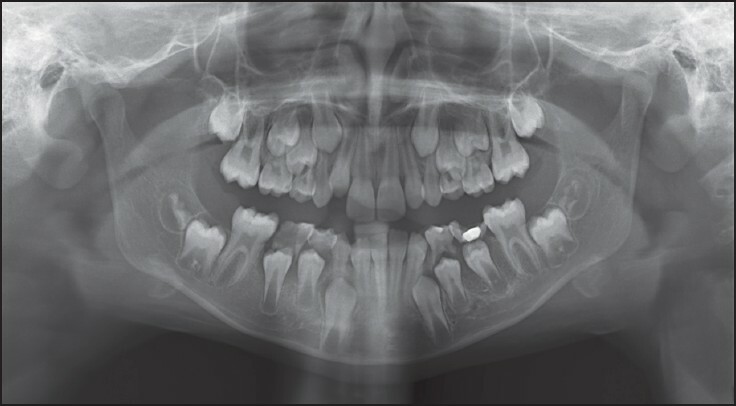 Ramakrishna Y, Verma D. Radicular cyst associated with a deciduous molar: A case report with unusual clinical presentation. J Indian Soc Pedod Prev Dent 2006;24:158-60. 12. Neaverth EJ, Burg HA. Decompression of large periapical cyst lesion. J Endod 1982;8:175-82. 13. Grandich RA. Healing of a massive maxillary lesion. J Endod 1977;3:119-20. 14. Samuels HS. Marsupialization: Effective management of large maxillary cysts: Report of a case. Oral Surg Oral Med Oral Pathol 1965;20:676-83.